One of the enormous and undeniable benefits of the internet is that it has made education accessible to people all over the world, regardless of location or even ability to pay traditional institutions for the ability to attend classes. BitDegree sees itself as the next innovation to that – can we incentive and “gamify” the learning experience, to make students more likely to continue studying? Behavioural economics has always argued that humans choose to do anything, and in particular stick with something boring and not immediately rewarding, more for reasons of incentives than anything else. If there’s no monetary or social incentive, then studying just because we like the subject, for example, is unlikely to happen. BitDegree tries to combine that idea with online learning platforms that have been around for years now. Is this really an innovation? Though I appreciate what it’s trying to do (motivate and encourage students), except for simply substituting bitcoin for traditional forms of money, it’s simply a way of providing scholarships. That’s great! But it’s not really a breakthrough. I absolutely give them extra points for supporting students. Wherever the resources to encourage students come from, that’s a good thing. Much of the planned success of BitDegree is the idea that employers will finance the learning of employees they have not hired yet, because they’re desperate for employees with certain knowledge. This seems incredibly unlikely. It would be much more practical for companies to pay for the education directly of the employees they already have, instead of betting on unknown employees who BitDegree has connected them to over the internet. Secondly, a major element of what makes any educational credential or certificate worthwhile is that it has a track record behind it that vouches for its success. It can be frustrating to have to pay a traditional college or university thousands of dollars for a degree – but once you’ve graduated, employers can trust that you’ve learned something from them. BitDegree simply does not have that reputation. This offers a good breakdown of what BitDegree is offering, and the alternatives. Coursera is by far the most well-known and has a significant reputation. 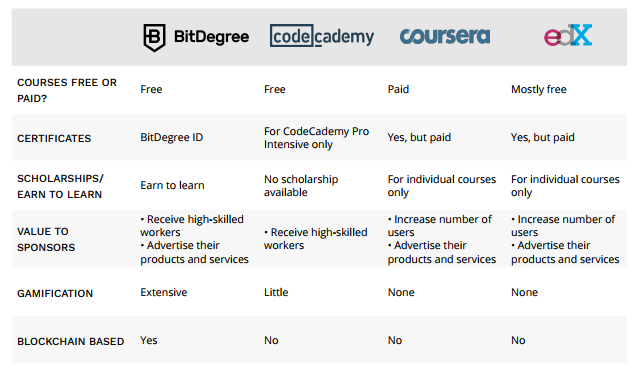 To surpass Coursera’s popularity, BitDegree will need to invest significantly in building up its course catalogue. Registering is easy and straightforward. There are several courses available for a variety of subjects, which is also encouraging to see. In what appears to be a slightly manipulative sales tactic though, they list high prices for each course (over $110USD), then mark it free for you. They also constantly bombard you with ways to get your friends to join, or ways to spend money on other items. It makes the experience feel geared toward profit, and takes the emphasis off a sense of education and career development. To be honest, I found the courses to be of low quality – they mostly just seemed like undergraduate PowerPoint presentations. With a little googling and news article reading, you could easily get the same information from more traditional sources. Here’s an example of the screen at the end of a course. Looks much more like marketing/promotion than respectable academic training and career development. Right now BitDegree only has tech and cryptocurrency related courses. There’s enormous room for it to grow and expand into different fields, which could lead to more opportunity. Unfortunately though, despite have an attractive website, they don’t seem very organized beyond that. Detailed information on the scholarships, their breakdown, amounts, etc. was not available, for example. So though I appreciate the effort, I don’t think they’ve made it yet. Their promotional materials often come across as a bright and passionate bitcoin entrepreneur looking for an outlet, much more than a well thought out and compelling business idea. They’re going to need to spend more on course development, and less on marketing, if they want this program to have any real academic merit. You can really see the emphasis on marketing when using the website. It’s constantly prompting you to sign up for more courses, or showing how many other users are there.